Over the last decade, the global grain industry has slowly but constantly evolved revealing the following market trends. The growth in worldwide population and grain production has led to an increase in demand for grain storage solutions and silos with bigger storage capacities. Increased capacity and speed required by industry players continue to have a huge impact on the grain trade, having namely motivated the need for larger-size equipment for the unloading of increasingly large vessels. These trends have become evident through various projects and requests that Belgium-based VIGAN has faced during the last few years. As a result VIGAN adjusted its equipment to meet worldwide industry changes and new standards. VIGAN Engineering S.A. designs and manufactures a complete range of pneumatic and mechanical conveying systems for products in bulk not only through the supply of equipment, but also by managing complete turnkey projects. While offering both mechanical and pneumatic solutions, VIGAN is widely recognized throughout the world as an expert in pneumatic bulk handling technology. 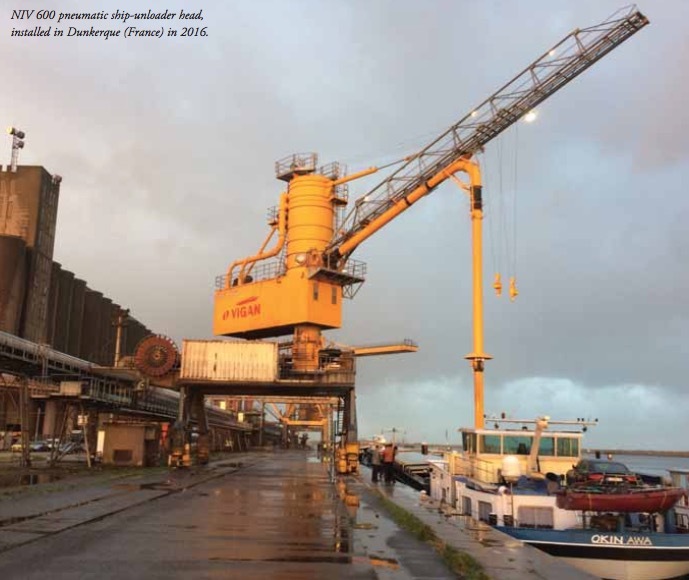 Pneumatic ship unloaders of NIV type are specially adapted to medium size vessels up to post-Panamax, mainly because of the boom length of the unloaders, which can reach up to 30 metres. VIGAN’s pneumatic equipment can handle most free-flowing products with densities between 0.5 and 0.9 and a natural angle of repose of less than 40°. Suitable products include all kinds of grains (corn, wheat, barleys,...), oilseeds, raw materials for animal feed, wood pellets, typical chemicals such as soda ash, alumina, and also slightly compacting products such as soy bean meal. Through an optimized and gentle handling process,VIGAN’s equipment does not damage the products. Each machine is customized and optimized according to the customer’s technical requirements and site specific- ations: gantry type (stationary, self- propelled on rubber wheels or on rails), unloading capacity (from 160 to 800tph [tonnes per hour]), boom length (up to 30m), diesel/electrical power unit and many special optional devices. VIGAN turbo-blower(s): VIGAN’s high-pressure three- to four-stage centrifugal turbo-blower(s) have automatic air regulators (also called frequency inverters) for optimized energy consumption (power consumption reduction of around 25% compared to traditional systems). filter & airlock: VIGAN’s pneumatic unloaders are fitted with a self-cleaning filter which operates through a jet pulse system (high pressure). VIGAN airlocks are produced in-house: different models are available to suit the diverse configurations. VIGAN’s telescopic piping system: VIGAN has never stopped improving the wear-resistance of its piping, particularly on the Ni-Hard (nickel-chrome alloy) elbow which has a life expectation exceeding ‘five million tonnes’. As each case is specific, VIGAN is helping its customers making the right choice of equipment. It is important to ensure that the machine selected is the most appropriate for the job to be done, which is generally a rather complex matter. As a matter of example, to unload up to five million tonnes of seeds per year,VIGAN usually recommends the use of one or two pneumatic ship unloaders on a gantry. For higher unloading rates,VIGAN recommends a mix between NIV and SIMPORTER (mechanical ship unloader). In this case, the pneumatic ship-unloader would be dedicated to also assist in the cleaning of ship holds, which is the least efficient phase during the unloading of seeds. no dust: filter with sleeves and automatic self-cleaning; and v low noise thanks to acoustic insulation. In order to adapt its equipment to market trends,VIGAN has evolved year by year to design, manufacture and erect equipment of higher capacities. The VIGAN ‘NIV 600’ pneumatic ship-unloader, first designed in 2000, has now become the standard, representing on average 60% of NIV- type pneumatic ship-unloaders sold by VIGAN over the last five years. VIGAN continuously invests in R&D and larger manufacturing facilities to offer handling equipment in line with the market demand. The company namely invests in the design of even higher capacity equipment, like 800tph pneumatic ship-unloaders. In order to serve its customers better and to be prepared for the future,VIGAN is expanding its manufacturing facility in Nivelles, with a major extension of an even larger pre-assembly hall. VIGAN is convinced that pre-assembly of all ship- unloaders in its factory guarantees quality and shortens erection time locally, thereby cutting expenses to the minimum.